Be our Guest for a scrumptious buffet breakfast or dinner (or weekend brunch) in the company of some of your favorite Disney Character friends. Select from an array of appetizers, salads, international entrées and, of course, a dazzling array of Beauty and the Beast themed desserts. Commemorate the release of the new live-action retelling of Beauty and the Beast with themed sweets at Lumière’s Kitchen. Featuring a live Chinese sugar-painting station that brings classic Disney characters to live, it’s the perfect way to celebrate the season—all while enjoying buffet-style dining. Come find Lumière, Mrs. Potts, Belle and all your other favorite characters from Beauty and the Beast, only at the Shanghai Disneyland Hotel! Have a fun-filled feast with Mickey & Friends at Lumière’s Kitchen this weekend. 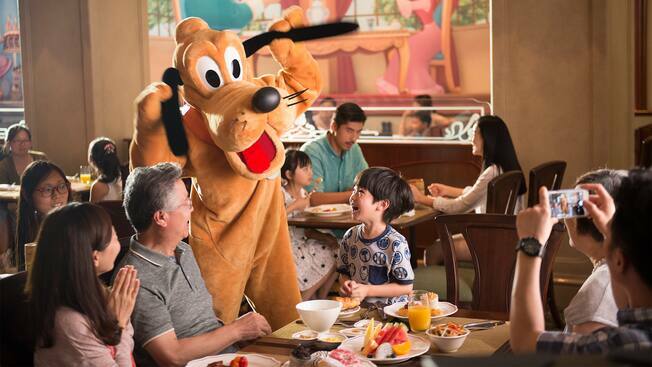 Entertain your taste buds and your imagination with yummy dishes and special star-studded appearances by Mickey and Friends at Lumière's Kitchen for a family weekend brunch like no other! Taste the magic of a buffet inspired by cuisine from around the world. Raise your glass to wines that sing and dance on your palette. And for the grand finale? Indulgent desserts, for a sweet happily ever after! Best of all, you don’t need to stay at Shanghai Disneyland Hotel, or have a Park ticket to enjoy this gastronomic fairy tale! Bon appetite! Relish a dining experience replete with flavorful fare that dances off your plate! Décor inspired by Lumière’s celebrated scene in Beauty and the Beast evokes the animated film’s singing spirit, but top billing goes to a buffet bubbling over with delectable dinner options fit for A-list appetites. The first act features an appetizer lineup consisting of savory soups and fresh salads. Act Two includes international dishes with elements of Chinese, Asian and Western cuisine. And don’t forget the encore! No award-winning performance is complete without a sweet reprise—from cheesecake to tempting Tiramisu and more, your palate is sure to applaud. While memorable meals are the hit of this show, you won’t believe who’s stealing the spotlight! Special appearances by popular Disney Characters add a bit of star-studded magic for the real “Bravo!” moment. Take cues from the paparazzi and make sure your camera’s ready for a close-up you’ll always remember.